'Uncertain, changing, and challenging' are the keywords to summarise the year in fashion according to BOF. Mounting pressures caused by speed-to-market, increased digital globalisation, discounting, political turbulence, terrorism and looming climate change are set to create a challenging time ahead. I can't help but think back to the recession years of 2008- 2010, where industry folk spoke of things being 'back to normal' in a few years. Today we face instability as the new normal. An excellent article posted on BOF highlights why employee wellbeing is the new focus for progressive companies. What better way for a company to engage customers than by letting us get to know their team? Especially if one is lucky enough to have a magnetic creative director like Jenna Lyons who, as you will see from this clip, is genuinely loveable. It's refreshing to see passionate individuals behind-the-scenes in a way that feels personal, warm and witty. Far from being overly produced and contrived, this little clip from J.Crew is informal, offbeat, authentic and loveable. It's creativity like this that helps mainstream brands acquire a more boutique and unique persona. Heritage, craftsmanship, and passionate people making it happen. What better way to communicate value to customers? It's no secret that cheap and poorly made product is now commonplace worldwide. Plagiarised, cookie-cutter and low quality fashion continues to dominate much of the mid to low markets. Some say craftsmanship and quality is simply a pursuit of the elite. Other's believe that an ethically made, high quality product is the most democratic of all. Either way, a simple truth lies in the fact that quality product isn't thrown in the bin after a few uses. Further still, if one values and cherishes a product for it's beauty and make, it will be kept and looked after for many many years. Whilst we may see less and less craftsmanship in the mainstream market, there's always one sure place to find craftsmanship in product and that's with heritage brands. Take Sanders, the English shoe company who still proudly (and profitably) make in England. Ongoing collaborations with American fashion designer Mark McNairy help bring their expert product to new markets (and for women too). It's a pleasure to watch this video below. And yes, apparently there are more than 5 processes to shoe making (although you wouldn't know it by the quality of today's broader shoe market). 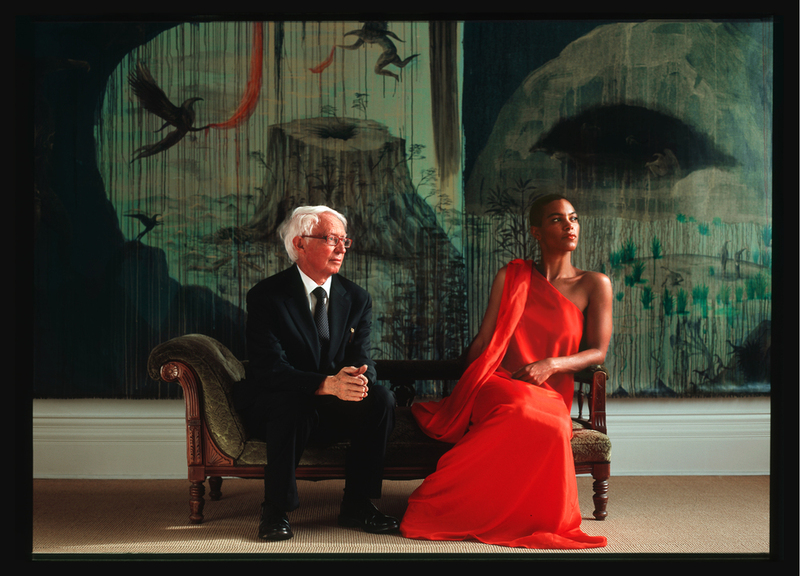 Our Spring-Summer 09 Campaign featuring art-dealer Peter McLeavey and performer Sheba Williams. Artist Bill Hammond appears in the backdrop. To honour New Zealand's most cherished art dealer, who nurtured artists such as Bill Hammond and Yvonne Todd from the ground up, Te Papa has published a book on the legendary Peter McLeavey. For me, McLeavey and his gallery are the pioneers of New Zealand's creative sector; an inspiring example of how art dealer and artist must work together in harmony to support and respect one another. Whilst many other NZ industries, such as design and music, lack strong commercial alliances that keep artists and industries alive, McLeavey has shown that artists don't need mega-corporations in order to have effective partnerships. Tapping in to a community's culture, ideals and values has been a big part of the McLeavey DNA. Selling a story, an artist and a sense of place has been an effective tool to bring artists in to peoples worlds. You might say that McLeavey is the quintessential marketer, with a gut feel for the market and social trends. His charming latter-day manner helps too, so authentic that every McLeavey family member possesses this same delicacy and regard for others. Here's the trailer for the book "Peter McLeavey: The life and times of a New Zealand art dealer". It features the campaign I once shot in his gallery (picture above). It is a book to cherish. A simple quote from Darwin that came up during a Merchandising Management lecture, got me thinking about how established fashion companies are adapting to the major industry change of the last 5 years. It’s the kind of subject that makes the veterans of the industry groan with agony, harking back to the ‘golden age’, of the industry and regulation. As the New York Times' Cathy Horyn wrote in 2011 'I keep hearing designers with long experience, and perhaps dwindling resources and customers, say, “I don’t understand anything anymore.” ' And although I am by industry standards a young designer, my experience is exclusively in independent luxury- arguably the most at-threat niche today. Most high-end and boutique designers have been worried for some time that the rise of affordable ‘designer’ product (think Zara) would price boutique designers out of the market. Which is precisely why Darwins words are very poignant when considering the industry today; the ability to respond and adapt to todays new market is the difference between life and death. So what does this mean for the future of high-end designer product? What the hell is going on in the industry where the world’s best designers are being minimized by new retail models and start ups? What is it that fundamentally requires designers to rework their entire strategies to remain competitive? Why aren’t superior clothes, stores and traditional advertising enough anymore? The fashion industry, like many other industries has had a lot to contend with in the last 5 years. For one, online retailing has affected brick and mortar retail revenues significantly, creating new demands on physical stores become more dynamic and experiential. It has also finally broken down international borders in a real way, with local companies now having to compete with discount clothing and free-delivery from the other side of the world (think Asos). Secondly, the new mainstream embrace of high/low has propelled the fast-fashion model to dominance, speeding up supply, delivery and demand. The cultural embrace of High St clothing at a fashion level has shifted the perception of these goods from ‘cheap rip-offs’ to ‘affordable luxury’. This no doubt has had an affect on the way we value product, particularly designer product; do we need to wait, pay more and buy the authentic model when other retailers are delivering what we want now? Is appetite and speed overriding quality? The third main change I believe is the effect social media has had on marketing, forcing the old guard to get on board the more instant, frothy, high- frequency approach the social networks embrace. It all seemed so silly at first with all it’s ‘selfies’ and teenage blogging, but in more recent years has defined the cultural shift of integrating yourself in to your customers world. You can’t simply tell customers about your product anymore, you need to get in to their reality and play alongside them. With all this in mind, high-fashion companies still need to maintain their assumed value in the marketplace. How this sense of value or luxury is communicated to consumers in todays digital and dynamic market place is the key. There are a few companies out there doing a great job at this. Burberry’s online store and website is arguably the best online luxury branding experience today. The store is both comprehensive and seductive, with garments viewable in high definition with multiple angles/ zooms of fabrication and detailing- even extending to a short video clip of the product. The consideration and generosity of the photography, videography and value communication is synonymous with that of a luxury brick-and-mortar retail outlet. It’s the kind of attentive service that leaves one smiling and feeling looked after. Lanvin’s company philosophy over the last critical 5 years has been to take the seriousness and elitism out of luxury by encouraging women to laugh and enjoy high-fashion again. Their pop-culture influenced video campaigns have made whitty viral statements and their embracing of social media has helped them connect to younger audiences. Offbeat products such as the text based ‘help’ and ‘cool’ necklaces from last season showcase this more playful cultural zeitgeist in product form. Lanvin has also successfully designed collections for high-st brand H&M and is one of many designers getting on board the high/low bandwagon. Stella McCartney cannot be ignored when discussing responsiveness to market change. Stella is aways one step ahead in not only product design, but also in integrating the all-important sustainability issues of today in to high fashion. This is no easy feat and not only makes her business model unique but captures the current mood of conscious consumerism. It’s the kind of win-win benefit that assists today’s luxury shopper to make purchases; luxury and a touch of ethics joining forces. All three of these high-end, established brands have an ear to the ground and are listening to social change. It’s almost like they took off their old sunglasses from 2005 and saw the new environment for the first time. Responding in various ways, they have managed to transcend market change and develop consumer focused strategies that reinforce their value in the marketplace. In so many ways it’s not just important to be able to respond to change, but to be ahead and anticipate it before it punches you in the face. For me this seems to be the key to navigating the new industry and new economy.